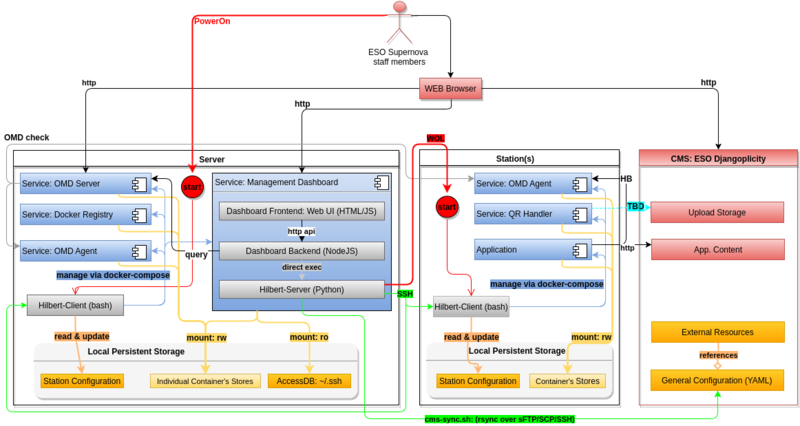 Hilbert is an open source infrastructure to deploy, start, stop, exchange and monitor digital interactives in museums, exhibition centers, public venues or data centers. It has been developed by IMAGINARY in collaborating with the Heidelberg Institute of Theoretical Studies (HITS) from 2015 - 2019. Bundling of digital interactives (interactive applications containing multimedia content that requires fast graphics and possibly GPU usage). This is currently implemented via linux containers (Docker), but additional backends are possible. Easy orchestration of digital interactives on a cluster of desktop computers by end-users: start, stop, dynamically exchange running exhibits/interactives. This functionality is especially important for modern museums, exhibition centers, science centers but also other organizations requiring orchestration of graphical applications. One can change the exhibits/interactives for example for guided tours or special topic events dynamically through an intuitive web dashboard. Generic monitoring using Open Monitoring Distribution (based on Nagios + Check_MK), and custom health check for applications. Hilbert is installed at the new ESO Supernova museum in Munich, the first open source astronomy museum, which opened in April 2018. Inside ESO Supernova, Hilbert successfully orchestrates more than 150 computers (running digital interactives, interactive screens, info screens, connected to physical input devices, projectors, etc.) and enables stable day-to-day operation since the opening. See here for more details on the open source exhibits of the museum. Hilbert is open source, its sources can be find in separate repositories under https://github.com/hilbert (see also Links below). Assistance in marketing and future business development strategy for Hilbert. Communication within a network of potential clients like science museums, science centers, science exhibitors, etc.